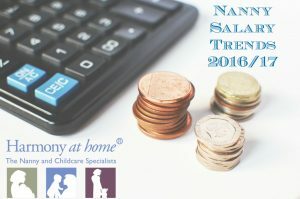 The results of the NannyTax Annual Wage Survey have just been published for 2016. This is the most comprehensive and up-to-date study of its kind in the UK. It is based on data collected from over 423 nannies, 771 nanny employers, and 62 nanny agencies—including Harmony at Home. 2016 has been a steady year for nannies in the UK, with nearly all nannies experiencing an increase in salary. Live Out ‘Daily’ Central London have been the only notable loser, experiencing a 17% dip in salary compared to 2015, interestingly Greater London Live out nannies experienced an increase of 11%. Outside London, average live-in nanny salaries have increased by 14.57% with the highest increase of 18% in Central London. Unsurprisingly, Greater London and Home Counties tops the table for the highest paid nannies in the country, with live-out nannies earning on average £35k gross salary per year. Compared to 2015, there has been a significant increase in awareness, among nannies and employers, of the auto enrolment scheme for workplace pensions. By the end of 2017, all nanny employers will have to make pension schemes available to their employees, irrespective of whether they qualify for auto enrolment. As with previous years, there was a large amount of confusion among nannies regarding their salary agreements. Most nanny employers prefer to negotiate salary based on gross income, whereas a significant proportion of nannies prefer to negotiate on net income. In 2016, this resulted in staggering 15% of nannies who were unaware of the nature of their agreements—i.e. gross or net! The clear majority of this confusion was among inexperienced nannies who were recruited directly by employers, rather than through an agency. At Harmony at Home we recommend that all nannies should negotiate salary based on gross income. 2016 continued the slow and steady decline in voluntary registration with OFSTED. With the introduction of the Tax Free Childcare scheme in 2017, we predict that the demand for OFSTED-registered nannies is likely to increase (Childcare vouchers vs tax-free childcare). It would appear that nanny agencies are promoting Ofsted registration as 67% of nanny agencies stated that their clients preferred an Ofsted registered nanny. 70% of nanny employers said that BREXIT will not affect whether they employ a nanny.